Hello my friends, how are you doing tonight? Me, I'm beat. I spent 7 hours wandering a fairly unbusy Six Flags New England today and I am ready for rest, but I have a question before I fall asleep. Well, I have some ice cream for you first, then I have a question. 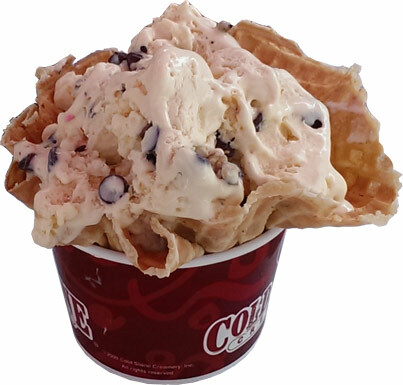 This is Cold Stone Creamery Cookie Dough ice cream in a waffle bowl. No, it's not mine. My buddy bought this for his daughter and a big bowl of cookie dough ice cream (sans waffle) for my daughter. 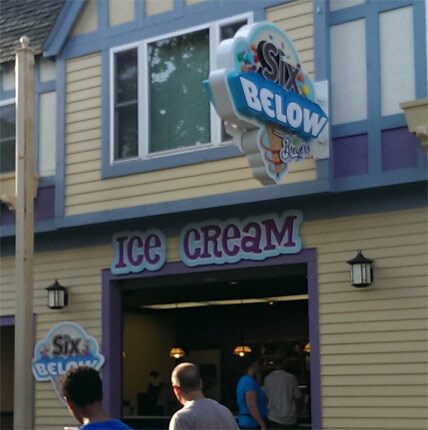 You see, we've discovered the secret of not going broke at Six Flags. Spend the extra dollar to double the size of whatever you order, and then split the food. We made short work of the ice cream after our kids could only make it half way through their treat. This trick also worked for the giant double cheeseburger and fries I split with my daughter. It was so tasty, and now it comes with less guilt! The ice cream? Yeah, it was awesome ofcourse, but it always is. Look close and you'll notice that they use tons of full size chocolate chips in their ice cream. How do you complain about that? Sure I could have used a few more cookie dough chunks, but the base ice cream is so rich and wonderful that you can forgive this (plus keep in mind my daughter may have eaten all of them). It's not a huge brown sugar vibe or anything like that, just a real nice base flavor that has been infused with a bit of cookie dough flavor. Ahh the beauty of super premium ice cream. So what's the biggest (basically only) complaint people have about Cold Stone? It's too expensive. So I have to ask, why would you try charging more for Breyers than you do for excellent cold stone creamery ice cream? Sure, there's the convenience that I don't have to walk to the one of the other cold stone locations, but even fresh Breyers isn't going to taste better than cold stone. As we were checking out the Breyers flavors and pricing, the family in front of us literally said "this is way too expensive, let's just wait and go to Dairy Queen". I was half tempted to give the dad a high-five but I kept to myself. Ok, that's it, have a good night. I have one more surprise for you guys this weekend and then I guess summer vacation is officially over. I would rather pay more and have the Cold Stone Creamery than Bryers. Bryers seems kind of tasteless to me lately. Hope you and your family had fun at Six Flags! This is often my gripe with places. My dad gripes about how burgers aren't 10cents anymore. (Yea he is old) :) Now I find myself griping about ice cream. Unless it is some super premium ultra flavor I rather go to my local grocer. Get a 2 for 1 of mediocre ice cream. Have 5 times the ice cream and still save money.